Those of you who read this blog regularly will notice a distinct lack of postings recently. The reason is simply that I've been away. 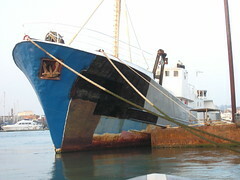 The painting on the hull is actually a relatively quick process, for such a dramatic overall improvement. Now with the big stuff on the hull well underway, my eye is naturally drawn to the other areas of Lady Jane that are suddenly crying out for attention. That stuff has always needed doing, it's just that as the big stuff gets finished so more and more of the smaller stuff shows up as needing doing. It's the smaller stuff, the detail, that really takes the time, but it's that which really makes the whole. 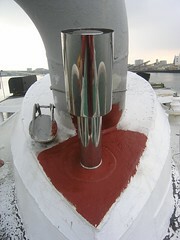 Take painting that piping on deck for example, things just look so much better there all of a sudden, now it's painted red. Now I'm not going all negative or anything here, just reminding myself that there is still so much left to do. The recent spelll of good weather has meant huge progres on the painting front. 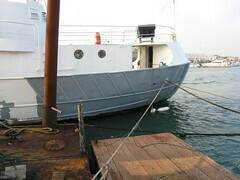 Here you see a coat of grey up on Lady Jane's port bow. That bald patch down the bottom there really stands out now doesn't it? Not long now and I'll get to rust bust that section as well. Getting an initial coat of primer on has to be the most satisfying of all the painting jobs on the boat, asides maybe for that final coat of finishing paint. There is still work to do on the heating system, something I suppose will never be finished until the whole boat is properly done throughout. 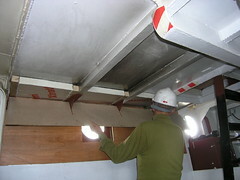 Here you see the wheelhouse radiator in the process of being plumbed in. 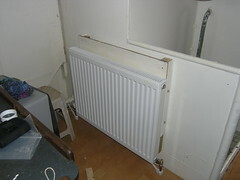 You can see the relative sizes of the old, gas, heater and the new radiator. 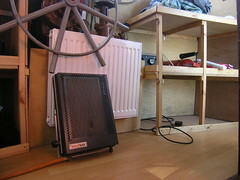 That gas heater could only just keep the place warm, so I'm expecting great things of the new radiator. I got the new radiator all mounted, all the pipe work plumbed in and routed down to the main feed for the central heating, then realised I was short one tee piece to connect the whole lot together. Doh! Ah well, Just one more thing to finish off. 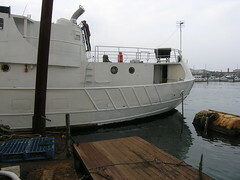 So with the painting well underway at the stern, the rust busting and cleaning up at the bow end has begun in earnest. Here you see the entire top section on the port side of the bow has now been cleaned up, and is ready for that all important primer. This does not look like that much, but I recall how long this all took on the starboard side, as that area is deceptively huge. Reach was always a problem before, which explains the step you can see by the way, though this time around the crane barge has been of enormous help. Another coat of primer - this time grey. A while ago I inadvertantly discoverd that Hempel do both a grey and a white coloured primer. That coupled with a comment from Seb, from Wendy Ann II, has changed the way I paint the primer onto Lady Jane slightly. Now I'll put down an initial coat of white primer, followed by a coat of grey then another coat of white. The idea being I can always tell exactly where I've been with successive coats of primer. Where patches of rust bleed through, I can then dab these patches with grey and follow that up with a second coat of white, to make sure I have a good coating over the whole lot before I put the finishing coat on top. 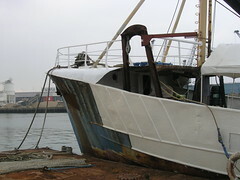 With the rust busting at the stern completed, attention now turns to the bow. 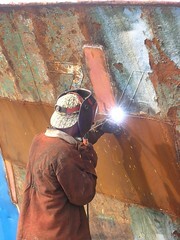 Here you see Robin putting the finishing touches to the plate he welded in in January. I know I've been doing some welding for myself, but when it comes to doing a proper job there's nothing like getting an expert in. 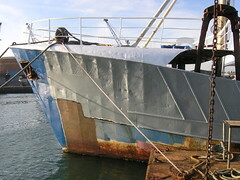 Even I find myself amazed by the sight of white primer down to the waterline all the way to the blue painted section at the stern. You can also just see Fred up the ladder there, tidying up the mess I made installing the rain cowl. Got to get those layers of primer on, before the rust can get back in there. So there you see a first coat of finishing paint on the whaleback and rails. It's always so amazing to me to see the difference a coat of paint makes to the overall look of Lady Jane. All the hard work in preparation is soon forgotten when you see the results. I'll have to keep a long pole on board to fend off potential passengers trying to board, thinking Lady Jane is a cruise ship about to depart for the Med! So that's the rain cowl for the central heating system finally welded in. I think the picture came out looking quite good in the end. The fact that the rain cowl was put in at all was all down to Fred's encouragement. Left to my own devices, I would have sloped off for an afternoon nap! I had originally planned to just bolt it on, not having the confidence to weld that thin stainless steel plate. In the end, the steel where the rain cowl was to go turned out to be overplated (new steel simply welded over rusty steel below), so I had little option but to weld the cowl in place. Bolting it would not have worked at all as it would never have made a proper seal against the rain etc. Next I'll need to seal the joins in the rest of the pipework with silicone sealer, and put in a series of self tapping screws to hold the lot securely in place. 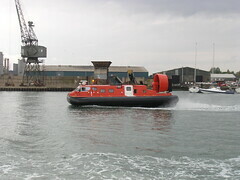 So this hovercraft came past the other day. No it's not the start of a joke, it really did swing by past Lady Jane. Now piloting that looks like a load of fun to me, though I'm not sure what the fuel bill must be like. I've always found hovercraft to be fascinating. So I've got another radiator plumbed in. This one is in the galley. It was originally going to be under the table, but when I rested it temporarily to the side there it just seemed to make perfect sense to mount just where it was. It won't be long before we are grateful for this warmth in the galley. 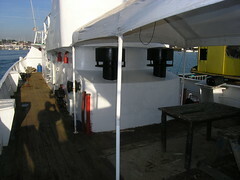 Next will be the radiator in the wheelhouse. Here Fred practices his templating skills, making a template for the deckhead ply 'skin'. Fred insists on wearing that hard had when working inside, as he keeps on cracking his head on the steel beams you can see. All this work is directly related to the central heating system installation on board, as I don't see the point of heating a space without making a reasonable effort to insulate it. This inside work is on account of more miserable weather down Southampton way again.